Description - The male has bright rufous upperparts and flanks and an orange-red throat. The female is green above with a rufous tinge on the rump and flanks. An abrupt high pitched call and various thin squealing notes characterize the voice of this species of hummingbird. Distribution - This hummingbird breeds from Alaska south through British Columbia, and in southwestern Alberta; they winter mainly in Mexico. Their natural habitat is in mountain meadows and forest edges. During migration and while wintering they frequent gardens with hummingbird feeders. 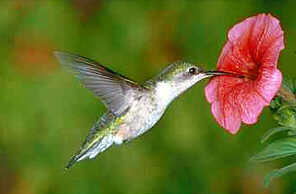 Biology - The hummingbird are the only birds known to fly backwards. While feeding, they do not perch but hover in front of the flower, sipping the nectar and picking off insects while on the wing. The first bird to a source of food will protect it. The sexes have separate territories and the female visits the male at mating time, after which the male moves away. They lay 2 white eggs in a lichen-covered cup of plant down and spiderweb attached to a branch.